Click on the photo for a larger view because you need to see the beautiful details Carolyn put into this piece. It's so pretty and just the right length...perfect for spring. Isn't that tag beneath it gorgeous too? It's a beauty and I'm so pleased at my good fortune. Make sure you check out Carolyn's jewelry. I'm offering a couple of my tutorials for purchase in my Etsy shop. One of them is my wire bird's nest tutorial. You may remember first seeing this little charm published in the second edition of Stampington's Belle Armoire Jewelry back in 2007. Although there was a brief how-to, I haven't seen a full tutorial on how to make these nests so thought I would offer one. A brief word about my tutorials: If you purchase one, I'll email it to you in a pdf format. You can see more about that in my etsy description. I offer these tutorials a few at a time. If you go to my etsy shop and don't see the one you want there, please email me or convo me through etsy and I'll get one into the shop for you. These tutorials have been made from jewelry of my own original design. They're not techniques I learned in a class or from a book. I ask, ever so politely and with the sincerest of warm fuzziness, that you please don't duplicate, share or teach them. Having said that, I want you to use the techniques you learn and...please....don't feel the need to give me credit! I'm just not concerned about that! My thoughts on this are; if I teach you how to make something, I don't want you to feel inhibited about using it. Be creative and expand on my techniques. Make your nests and links...incorporate them into your very own jewelry designs and other projects...sell them or give them as gifts...have fun with them. I hope you enjoy the tutorials! I bought this gorgeous bracelet from Dee some time ago. She makes the most incredible cabachons and other stunning polymer creations. ...and tied a bit of silk and tulle at her nose that makes her look like she's feathering her nest. Velvet rope in a soft blue seemed the perfect way to hold my little bird in place and I added some vintage aurora borealis crystals and a small, hand-made clasp to finish the piece. If you want to join me in this challenge, you can do any of the projects. The ones I've finished are listed on my jewelry challenge blog here...participants projects are listed in the links in the left sidebar. If you participate, your name will be in a drawing for as many of the projects you complete. I'm giving away two pieces of jewelry I've finished from the challenge. I hope you join me...it's fun! I'm blessed to have the most wonderful mailman. He truly understands my mail needs. He doesn't cram my magazines into the box the wrong way so the spines break. He doesn't stuff so much into the box that I can't get it out. He's ever so careful with my fragile mail and always delivers my boxes to my door. He's very special and they reason I really know this is that every time I see him he ends our conversation with "Have a blessed day!" What a great guy. I often wonder what he thinks of my deluge of magazines, packages and boxes. Not to mention mail art. I love being inspired by my fellow artists, whether it's mail art or fine painting. One inspiring spot I like to visit is Seth's Altered Page. He loves creativity as well and always has something fun happening on his blog. I'm especially fond of his collaborations. I'm participating in his disintegration project as you can see from my previous post here. I'm a little surprised that my disintegration piece hasn't deteriorated more. Then again, we're in drought conditions here so it's not getting as much weather as it could. Seth has added a sidebar to his blog entitled "Inspiration Station." It's something he first saw at Prism Trail. It's a link you can click on and it will take you to what is currently inspiring to Seth. Great idea! So, guess what? I've added a similar link on my left sidebar called "The Ever Changing Link Of Inspiration" (don't worry, I checked with Seth first!). I'll be changing out the link whenever I run across something particularly inspiring to me. This is stuff I really think you should see so please, check back and click on the link often. My first inspiration is from my friend, Crystal Neubauer. Crystal is so very inventive and versatile in everything she does. I hope you'll check out her blog. Thanks to Chris and Seth for the ever-changing link idea and to Crystal for the creative stimulation! The other day, a friend passed on a link to this sad farewell to one who will be sorely missed, by Mandy. Thank you Mandy for giving us something important to ponder. Last week was a roller coaster ride of terrific and not-so-terrific for me. At least I can say that life is interesting! A terrific thing: a Christian sister contacted me, out of the blue, with huge encouragement. (She also reminded me how much I like making artist trading cards so I thought I'd post some I've done over the years). Another terrific thing: Facebook. Who would have thought?? My friend, Catherine, is the one who convinced me I needed a fb page. To tell you the truth, I didn't see much point in it but...I am amazed by the people who have found me there. People I haven't heard from in years and, this last week, someone in particular found me (you know who you are!) that I've waited for a long time to hear from. I'm overjoyed to have this person back in my life. So, it turns out, you were right Catherine! A third terrific thing: God brings good from evil for His people (Ro 8:28). This weekend, my pastor spoke eloquently on this subject. It's amazing that this is the very thing I needed to hear at the exact time I needed to hear it. I bet there's someone else out there that needs to hear it too! Here's the deal: We are all subject to harm from the evil actions of others. As my teenagers would say, true 'dat! Whether it's on a large scale, such as genocide or as small scale like gossip, we see it every day. The good news is that God is in control. As bad as things look or feel to us, He sees the big picture. He is the expert at justice...we are not. (Ro 2:5-6) We are to wait for the Lord, be strong and take heart (Ps 27:12-14). In other words, let God work (Heb 10:30-31). Wait, pray, and let God work. I don't know about you but, usually, I want to take matters into my own hands! The problem with that is that, when we react, we often act badly and it's often out of anger. One of the great stories our pastor brought to our attention was of David, just before he became God's chosen king of Israel. 1 Samuel 25 has David, still being pursued by, then king, Saul. David and his army of mighty men were in the desert and had protected the property and flocks of a man called Nabel and his wife Abigail. Keep in mind that Nabel also means "fool." Nabel was a wicked man who had greatly offended David and his men. In anger, David set out to kill Nabel but Abigail, Nabel's wife, ran out to meet David and his troops. Abigail wisely stopped them from killing Nabel by telling David that, if he went through with it, he would have "the staggering burden of needless bloodshed" on his conscience by having avenged himself. David's vengeance would not have been God's work in this case. David was reacting. The terrific thing from all of this, is this question: "What will you become in your anger?" David's anger would have made him a murderer and seriously eroded his integrity. God empowers us to fight evil in this way: act justly, love mercy (be kind), and walk humbly with God (Micah 6:8). We are not to let bitterness (pride, animosity, rivalry or anything else harmful to others) take hold in us and let it "defile many" (Heb 12:15) but, fight evil by doing good (Ro 12:21). Easy, right? I will also be empowered by questioning myself before reacting: What will you become in your anger? A terrific question that will stop us in our tracks and keep us in the good fight. The focal for Mary's piece, in the book, consists of a textured and wrapped piece of sheet metal for the bottom with weaving on the top. Mine actually didn't end up looking much like Mary's as I decided to use a piece of silk carrier rod for the bottom of my focal, instead. That created a pod shape, which I filled with beads, then added a faceted smoky quartz dangle at the bottom. The top of the pod is woven sterling. I decided to wrap little curly-cues at the top, which gives my pod a flowery sort of look. Because I used the silk, I set eyelets around the top edge for added strength. I created some sterling wrapped links with more smoky quartz, a vintage aurora borealis crystal and a wonderful matte tiger-eye bead...also, a sterling clasp. I finished it off with two strands of fabulous, delica beads; one in deep brown, interspersed with faceted pirite chunks, and the other in a silvery bronze color. How gorgeous and sparkly these delicas are! They're tiny, faceted, glass tubes...so pretty. This piece is listed in my Etsy shop. These pieces were from project 5 and project 11 and were two of my favorites. Don't forget, you get your name in for each project you do. Go...create...then link! One of the first things that caught my eye was this rich and creative "Tempest in a Teapot" piece by Sandra Evertson. Sandra is so inventive and inspiring! Take a look at the magical, little world she's created in her latest blog post. Beth Quinn used one of my favorite things in her dazzling assemblage, vintage gloves. Also, German glass glitter, vintage rhinestones, pearls...well, you get the idea. Several Marie-themed art journal collaborations are featured so there is plenty of luscious inspiration for collage and mixed media. These books are absolutely festooned with vintage ribbon and trims, fabric and ephemera, flowers and gems...a visual feast! And, oh, the jewelry. My dear friends and jewelry artists Diana Frey and Diane Cook are in the good company of the brilliant Amy Hanna. They all created special, accessories, fit for a queen. Amy also concocted a few other pretty things using...well, you'll just have to get the magazine to see what she created and how fabulous it is! All of this and, to my delight, I have a few pieces featured as well. It really was such fun working on these decadent jewels for the queen. ...sterling, silk, pearls, crystals and gemstones. ...and a personal quote by the queen. The complete quote is "If the people have no bread, let them eat cake." She also said this: "There is nothing new except that which has been forgotten." And this: "Courage! I have shown it for years; think you I shall lose it at the moment when my sufferings are to end?" And, matching earrings...we can't have the queen's earlobes go wanting for adornment! I hope you've enjoyed this little visit with Marie. If you like what you see, there's so much more. Get a copy for yourself, grab a cup of coffee and a piece of cake, and enjoy this extravagant celebration of all things Marie. First things first...thank you so much for your response to copies of the zine that I offered. The zines I had are now gone but I'm working on getting more. I'll post here about it when I do. So, if you wanted a copy and didn't get one, you may still be able to get one from my partner in crime, Catherine. Check here. Exciting news! Registration for Art & Soul, Portland is now open. I'm teaching a two day jewelry making workshop called Wingkeeper. You can check it out here. "One of the criticisms out there of artful bloggers is that what we show on our blogs isn't "real." That what is authentic is actually kept hidden in the dark and deep recesses of our minds...recesses that are kept under wraps...as only the pretty and tidied up parts of our everyday lives are what get posted by artful bloggers. To which I say, so what? !...There are some who also argue that artful blogs with a focus on the positive are too distilled and sugar-coated to inspire anything meaningful or thought-provoking. To which I say, are you kidding me?!" I've often thought that, because of the content of my blog, readers might get the idea that my life is all flowers and unicorns. And, guess what...it is. Well, mostly it is. Actually, it's like anyone else's life...some days it looks more like weeds and donkeys. But, in my mind, those weeds and donkeys don't look so bad! Here's what I've learned: happiness is a state of mind. It's what you make it. Happiness is a choice. Happiness is a temporary condition, affected by circumstances and feelings. Happiness feels good but is fleeting. The real and lasting thing we're after is joy. Joy is a reward of being Spirit filled (Gal 5:22-23). Joy is that deep and delightful sense of well-being that lives inside us. So, what's wrong with exhibiting a little joy and happiness on our blogs? What's wrong with a little sugar-coating? Along with Jenny, I say...nothing! I doubt my readers would be inspired by my uninspiring, day-to-day difficulties or the occasional negative thought that comes through my head. Instead, I choose to focus on the positive and, hopefully, pass on a little inspiration while remaining true to that authentically joyful part of me. Thank you Jenny, for giving us permission to gussy up! Care for a little sugar with that? If you'd like a copy of your very own (and, you KNOW you do! ), email me at mocknet@sbcglobal.net Cost is $40.00 plus $8.00 for shipping and handling (paypal only please), unless you're outside the United States, in which case s&h will be more. There are only a few more days left until registration begins for Art & Soul, Portland, 2009. I'll be teaching a two day jewelry making workshop called "Wingkeeper." 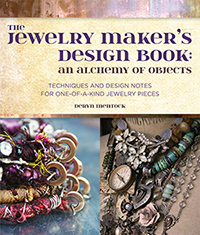 The class is loaded with a tons of jewelry making techniques. The necklace we'll make is really beautiful and unique. We'll work on several interchangeable focals for the piece in addition to the necklace itself. This year, there are so many talented artists offering terrific classes. You won't want to miss it. Sign-ups start March 15. I'd love to see you in class!